Refill, the award-winning campaign to prevent plastic pollution by connecting people with free tap water, launches in Greater Manchester with the installation of two water fountains in Bury as part of a pilot scheme. It marks the start of a growing network of free indoor and outdoor water refilling stations across the region to reduce the number of plastic bottles going into our waterways. The new water fountains in Bury have been funded by Eunomia and the pilot is in partnership with Refill, United Utilities and the Greater Manchester Combined Authority (GMCA) as part of the Mayor’s Plastic Free GM Campaign. The first bottle filling fountain will be installed in St Mary’s Park in Prestwich, with another indoor fountain planned for Prestwich library. The bottle filling fountain in St Mary’s Park will be switched on on Monday 20 March as part of the Mayor’s Green Summit. 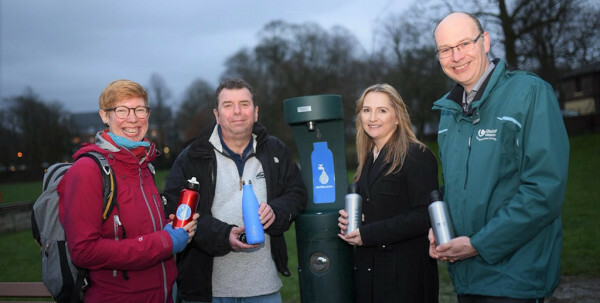 There will be an additional two public refilling stations planned in Ramsbottom and Radcliffe in the coming months, as well as an increase in cafes and restaurants signing up as Refill Stations to offer free throughout Greater Manchester. The average adult buys more than 3 plastic water bottles every week* – a startling 175 bottles every year per person. In total, some 7.7 billion plastic water bottles are bought across the UK each year, resulting in substantial amounts of single-use plastic waste ending up in our oceans. Councillor Alex Ganotis, GMCA Green City Region Lead said: The launch of the Refill pilot in Bury is part of a growing range of initiatives across Greater Manchester to help reduce the amount of single-use plastics we use every day. Schemes like Refill are making a big difference, making it easier for people to use refillable bottles, cutting down the amount of plastic waste that ends up as litter and harms our environment. At this year’s Green Summit, we will be launching our five-year environment plan to set us on the path to carbon neutrality in 2038. A key priority is to eradicate avoidable single-use plastics in Greater Manchester, moving to more sustainable options, promoting re-use first. We look forward to a successful partnership and seeing further Refill Stations and fountains rolled out across our city-region. Astonishingly, if just 1 in 10 Brits Refilled just once a week, we’d save around 340 million plastic bottles a year! The Refill app helps to make refilling as easy as possible with some statistics to show how you’re positively impacting the environment by refilling. There are now more than 17,000 refill stations signed up in the UK alone – including railway stations, airports and high street chains such as Costa, Starbucks and Wetherspoons. If they are all used just twice a day, together, we’re stopping around 10 million plastic bottles at source in a year. Find out more about Refill and how you can take part at the Refill website at www.refill.org.uk to download the free Refill app and find out more about the Refill movement.